Summer – a new season is here! Sunshine! Warmth! Time for so many fun things. My summers are filled with swimming, fishing, kayaking, and ocean fun. I love it- it’s time to do all of these things all over again. Summer is also a time for cook outs – lots of hamburgers, dogs, steaks and sausages on the grill, macaroni salad, picnics and outings with family and friends. It feels like vacation every day. We also enjoy walks in the wooded areas and on the beach, bike rides and movies. We spend time planting flowers as well as watering and weeding them. Summer is also a time for relaxation. 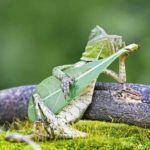 Like the lizard I love in this photo, I want to sit back and take it easy, strum my guitars and enjoy. When I play my guitar, violin, or piano, I am reminded that I am not that great. Even with practice, practice, and practice, I still can’t play for anyone to hear. But I still enjoy making music. I am almost a musician. I also dabble in artwork. There is nothing I like better in life that sitting and creating a beautiful picture. I work furiously with my art teacher to do this. She and I realize my limitations, but she still works with me. We laugh and joke and work on a given project for the day. We are friends. I don’t let my mediocrity stop me. She likes that. I am almost an artist. I also enjoy writing. Beatrix Potter said there is nothing more delightful than sitting to create a new story – or something like that. I agree. I have so many ideas floating around in my head at one time I have to jot notes to remember all of them. I am currently working on a little story about some search and rescue dogs searching for Christmas. Many adventures await them in my story. I am almost a writer. Time for dinner and it’s my turn to cook. So, what do I do? Well, I visit our local grocery store – Publix – where they claim it is a pleasure to shop. It is. Everything is fresh and delicious and there are many items to choose from. I rush in and out with my fried chicken and potato salad and home to have dinner with Dad. I am almost a cook. Well, summer is beginning. We are off to a great start. Many things to do. Hope all is well in your neck of the woods and you are ready for adventure. Happy Summer 2018 to all! And enjoy everything – whether you are almost perfect of not.